All Holy Heavenly Bodiless Hosts, vouchsafe us your power to cast down all evil and passions under our feet. Holy bodiless Seraphim, vouchsafe us to have a blazing heart towards God. Holy bodiless Thrones, vouchsafe us to discern the truth from the untruth. Holy bodiless Dominions, vouchsafe us to dominate over passions, so that the spirit should govern over the flesh. Holy bodiless Powers, vouchsafe us to have courage in fulfilling the will of God. Holy bodiless Authorities, vouchsafe us to have the power of victory over evil. Holy bodiless Principalities, vouchsafe us to serve the Lord God in the purity of our hearts and our hands. 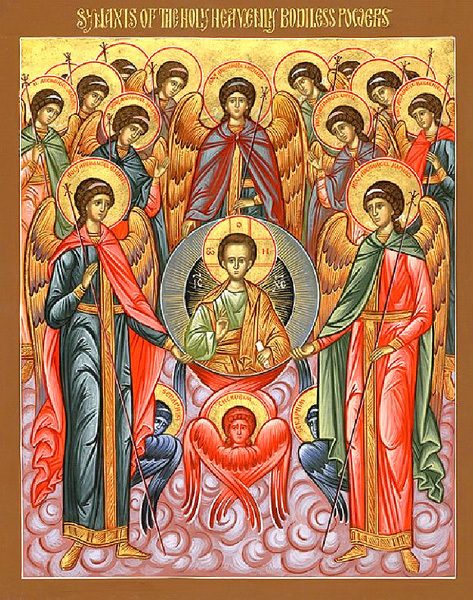 Holy bodiless Archangels, vouchsafe us to fulfill the will of the Lord Jesus Christ. Holy bodiless Angels, vouchsafe us to instruct the weak enlightening them in the truth.